Optical Heart Rate Monitoring is Improving « Adafruit Industries – Makers, hackers, artists, designers and engineers! Over the last two years companies such as Apple, Garmin, Fitbit and Polar have each released multiple wrist based activity tracking models that have optical HRMs (heart rate monitors). Consumers who had an interest in heart rate based exercise training before these were available would typically purchase a chest strap that would talk directly to a smart watch or phone. The chest straps have been around for over 30 years and are still slightly more accurate than the modern optical HRMs. However, recent reviews comparing optical HRMs versus chest straps to be within 4 BPM of each other in most scenarios. 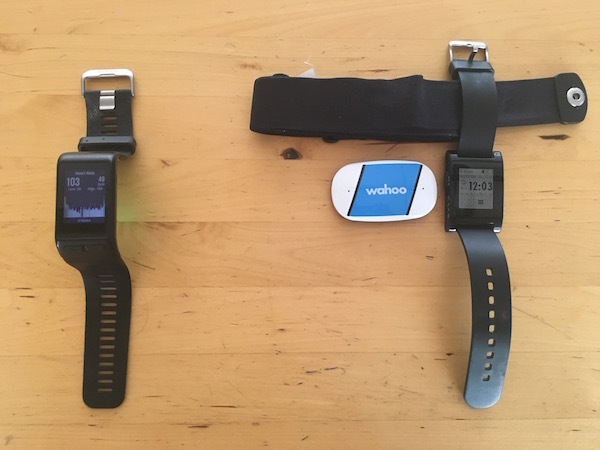 Last weekend I setup a test to compare the accuracy of a Garmin Vivoactive HR watch which includes a built-in optical HRM to that of my Wahoo TICKR chest strap. What I found was that the optical HRM in the Garmin jumped around a bit more but tended to be +/- 4 BPM of the chest strap. The delta heart rate graph above shows both devices during a nine hour trail run in Santa Fe, NM. The narrow aqua band represents the chest strap data and the wide pink band represents the Garmin Vivoactive HR data. This graph was made using the open source program GoldenCheetah which has a great compare mode. The only place where the optical HRM would create garbage readings was during steep hill descents. I would get skews for less than one minute in duration that were over 30 BPM higher than the Wahoo TICKR. Perhaps related to the excessive bouncing or sweat interference? Tom’s Guide – Who Has the Most Accurate Heart Rate Monitor? My testing and other sites that have reviewed wrist based activity trackers with medical grade EKGs show that the time has come to embrace optical heart rate monitoring for recreational endurance athletes. In most scenarios the optical HRMs are within 4 BPM of their chest strap counterparts and far more convenient to use. If absolute precision is key then it’s back to the chest strap. If you are primarily doing HIIT (High Intensity Interval Training) or weight work then a chest strap would be more responsive. What is your preferred way to monitor heart rate? In my experience with the Apple watch (which at launch got great reviews for its heart rate monitoring), the performance during running is a very poor predictor for heart rate monitoring performance in general. It seems the movement artefacts from running are relatively easy to filter out. For other rythmic exercises (weight lifting for example), it typically under-reports heart rate by half or third for me, so it misses half or 2/3rds of pulses, pretty useless.